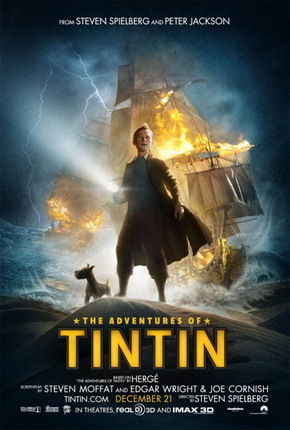 Hergé prided himself on his attention to detail, expressed through his clear line style of drawing, yet there is a lack of attention to detail in this film that is annoying at times. When, for example, Tintin and Captain Haddock need to get into a sultan’s palace, they suddenly appear inside without any explanation as to how they got in. Later, when they are chasing bad guys, Captain Haddock pulls out a bazooka, which he inexplicably got off a palace guard. Why would a guard be carrying a bazooka? What’s more, the film appears to take place during the 1930’s, before bazookas were even invented. Another anachronism occurs when Thomson and Thompson are referred to as being members of Interpol, although that agency was referred to as the International Criminal Police (ICP) at the time. And when Bianca Castafiore is introduced to the sultan, she says, “This is my first visit to the Third World.” This line makes no sense on any level, especially since the term “Third World” wasn’t used until the 1950’s. The film’s ending promises a sequel, but I honestly don’t think that Spielberg should bother. It’s much more fun to read the original Tintin books. This entry was posted on March 9, 2012 at 8:12 am and is filed under Christianity, Comic Books. You can follow any responses to this entry through the RSS 2.0 feed. You can leave a response, or trackback from your own site.